I admit I'm very late to the chalkboard loving party. 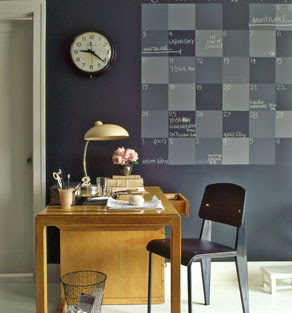 It wasn't until I saw this picture: over at The Scoop that I realized what a gorgeous design element a faux-board could be. Here are some more I liked after googling about: Martha Stewart's people mixed their paint to create different shades then went crazy with the levels and measuring. Lovely, if impractical for me. I love monochrome and the simplicity of this set. This would be so easy to do on a budget. These guys are big cheaters! 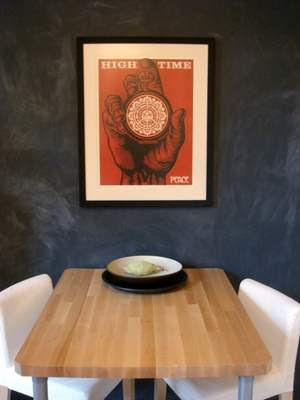 Look what their description says: "I mixed Benjamin Moore black chalkboard paint with Rustoleum green chalkboard paint (more black than green when mixing). They were mixed in the paint tray with no scientific measurements from batch to batch as I painted. 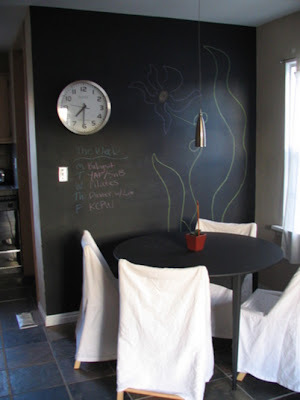 With chalkboard paint, it needs to "cure" for 3 days before you draw. My goal was to have a very uneven washy feel, so after the curing, I drew on the entire wall with the side of white sticks of chalk. Then cleaned the chalk off with a slightly damp sponge. The more the sponge wipes the more smeary the chalk gets which is exactly what I wanted." Its a cool effect but it doesn't seem like he's planning to write on this wall - so is it any more or less relevant than people who leave up the same quote forever? This one is strangely compelling. I can't make out what the words say but since its a dining room I bet its food-related. 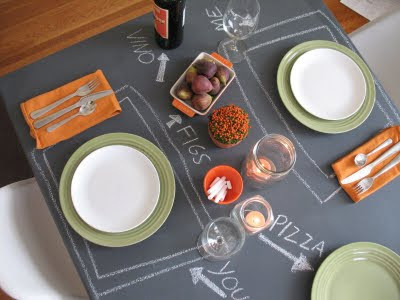 As an english major I'd wrap a sonnet around the room :) I love this table! Click here to read about the process of creating it. Its too bad (?) we already own the perfect glass table for our current space. 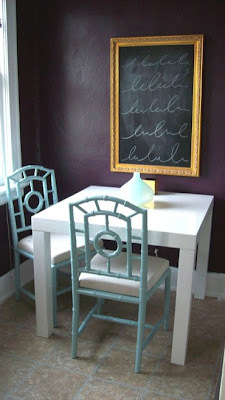 I love chalkboards and plan to have many when I um, eventually, get a house! Those are awesome! The calendar is really neat. Thanks for visiting my blog & commenting my cabinet to chair. You could also pick them up cheap at a ReStore.